parent will feel cared for, respected and comfortable. At Safari Learning® we believe that young learners need access to wonderful, open-ended materials and equipment that stimulate thought, play, analysis, evaluation, oral language, cooperation, interaction — and just plain fun. Not all things have to be considered “educational” to be educational. We continually provide a unique, innovative and integrated curriculum (concepts, products and materials) that aligns with the principles for developmental learning as established by the National Association for the Education of Young Children (NAEYC). Best teaching practices, based on well-established and rigorous research, guide our curriculum choices and approaches. A print-rich environment enhances student understanding of oral and written language and provides a foundation for future learning. 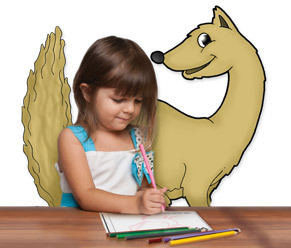 For this we use the Zoo-phonics® Multisensory Language Arts Program. Zoo-phonics® integrates all aspects of language arts (phonological awareness, the alphabet, print information and oral language) with math, art, music, science, social studies, resource conservation, cooking and nutrition, sensory motor, physical education, grooming and self-care. And, because we believe in fantasy, imagination and just plain fun, we promote plenty of giggles and movement while “Using the Wild to Teach the Child… to discover, play, enjoy and learn” with Zoo-phonics®, our animal friends, and the world around us. Contact us today for more info and for a tour of our premium facility! ENROLL AS EARLY AS POSSIBLE! Safari Learning has a waiting list to enroll. a spot for your child.